Years ago, like the mid-90's, I made a family history fan chart for my parents as a Christmas gift. 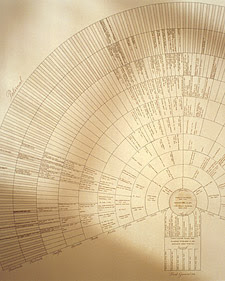 I was interested in family history, and I knew our family already had extensive records so when I saw this Fan Chart in the Martha Steward Catalog, I purchased TWO of them. With one of the charts I carefully penned each name into their corresponding generation box. Then I had it framed and wrapped for Christmas. The second chart - oh, I wish I knew what happened to the second fan chart. I suppose one day I may find it in the abyss of stuff I still have floating around my parents home (along with all my empty CD cases). Martha Stewart has long since stopped making these fan charts. Which is a shame, they were such a beautiful and simple way to view your ancestry. As it turns out, there happens to be someone else who liked this fan chart as much as I do. She's even gone so far as to create one in a jpeg format for FREE! It's meant to fit a 20x28 inch frame. I would have added it to this post, but blogger didn't like the size of the picture. So, if you have any trouble finding it from this link, let me know, I'll email it to you. I'd like to see if I can add the names in photoshop and then send this off to have it printed on canvas. Wouldn't that be cool? The chart I made for my parents still hangs in their home. I think we've all been surprised at how often we look at it, and use it as quick reference to our ancestry. Jillian, I'm so glad it will work for you! It really is such an easy way to look at your genealogy at a glance. Happy Family History Hunting! I also used the Martha Stewart fan chart for my parents and myself and really loved the classy look of it. A few years ago I did one for my Uncle and could not find a M.S. chart anywhere on the web like I used, I was so disappointed but the chart turned out really nice as well. Thanks for the blog! to A Girl and her Needle (AGN) or any one: Do you provide a "Martha Stewart" same size. Or where can I get one. I do not have the printing capacity for one that size. Nancy, you can have what's called an Engineer Print or Poster Print done at any office supply store. Last I checked Staples could print it for under $5.00. I would assume other places would be about the same. If the link doesn't work, let me know and I'll email you the chart. I can not get that link to work from artdork. I tried off the Martha Stewart page and your post. I love that family tree and disappointed to find that MS sold it at one time but has discontinued it. 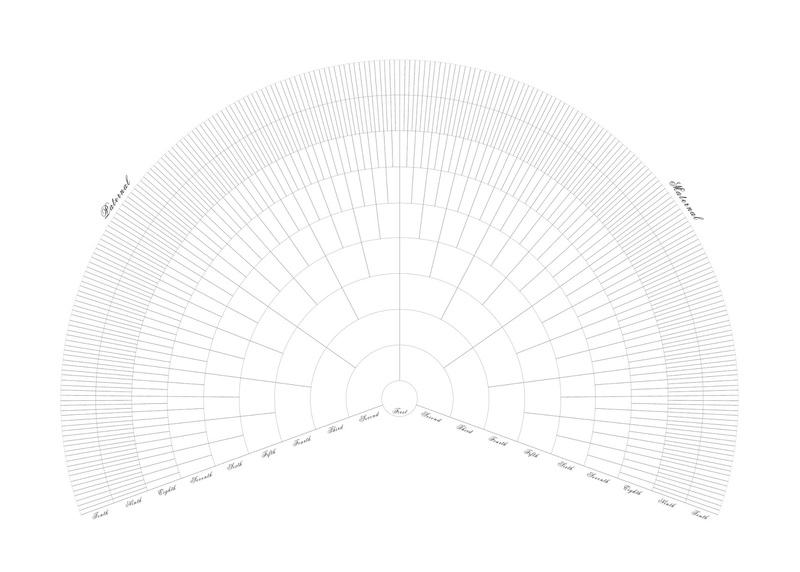 How do I get a copy of the tree from artdork? I am very frustrated that I can not find the template anywhere. I'm sorry you can't get the link to work. Please send me an email to charmainrunyon@gmail.com and I'll forward you the tree. Does someone have a copy of this large sized fan chart they would be willing to sell? For What It's Worth ... I couldn't get the link to work right either, but right-clicking the link and selecting "save target as" on a windows machine, worked like a charm! I'm so glad I ordered this from her while she was still making them. I have it filled out lightly in pencil and now have to go back either with the fine calligraphy pen, archival quality, in a dark sienna. It's going to be gorgeous. I've kept it in the flat shipping box all these years to protect it. I have the original Martha Geneology Fan Chart and would like to sell mine!